Pakistani forces have detained 100 suspects during an operation against al-Qaeda and Taleban fighters holed up in the north-west of the country. 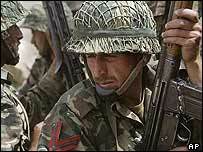 Up to 500 armed militants are believed to be trapped in mud fortresses close to the Afghan border. 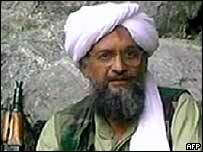 A senior al-Qaeda figure is reported to be among those cornered. But Pakistani officials have dismissed speculation that it is Osama Bin Laden's deputy, Ayman al-Zawahri, regarded as the brains behind al-Qaeda. The commander of the Pakistani operation, Gen Saftar Hussein, said intercepted telephone conversations suggested the principal target was an Uzbek or Chechen militant commander, who might have fled the area. He said a bullet-proof vehicle, flanked by two cars, had raced through a line of troops on Tuesday, and its whereabouts was now unknown. Across the border, Afghan forces say they have fought off an attack by a group of suspected al-Qaeda militants who had fled from Pakistan to escape the continuing operation against them. Afghan commander Zakim Khan told the BBC that Afghan and American troops had killed three of the militants and driven the rest back into Pakistan. A few days ago, Pakistan's President Gen Pervez Musharraf said his forces had surrounded what he called a high-value target, fuelling speculation it was Zawahri. But Brig Mehmood Shah, who is in charge of security in the region, told the BBC he believed both Zawahri and Bin Laden were in Afghanistan. Gen Hussein said the 100 suspects apprehended included al-Qaeda members, renegade tribesmen and Uzbek and Chechen Islamic militants. Journalists in the town of Wana, near where the assault is taking place, were shown 40 blindfolded prisoners in the back of an army truck. Gen Hussein said this phase of the military operation would be completed in the next few days. But he said Pakistani forces were still fighting pitched battles with a force of 400-500 men. Pakistani troops, backed by helicopter gunships have pummelled the area where the militants have been dug in for several days. The militants have been responding with mortars and rocket-propelled grenades. 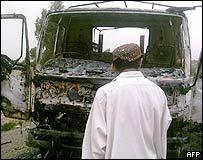 According to reports from northern Pakistan, 11 civilians were killed when their vehicle came under fire during the offensive. Initial reports said the victims were trying to flee the zone of conflict when they came under attack from a helicopter. There has been no confirmation of the deaths from the Pakistani authorities. But earlier, a senior Pakistani army officer told The Associated Press that a US helicopter had fired rockets at a car in the Alawarai Mandi district of North Waziristan, just inside the Pakistan border. Speaking on condition of anonymity, the officer said he was uncertain whether the US military knew they had strayed into Pakistani territory. Lt Col Bryan Hilferty, spokesman for the US forces in Afghanistan denied the claim: "There are no American or combined forces over there." The possibility of US troops entering Pakistan is a sensitive issue. Although Pakistan's leader President Gen Pervez Musharraf has supported Washington's war on terror, he has repeatedly said that American troops would not be allowed onto Pakistani soil. "There are 70,000 Pakistani troops now spread across the area"